With Charlotte’s recent buff, I decided I would take a look at the overpowered little cinnamon roll that I own. My first natural five-star was Charlotte, the wind Occult Girl. You’ve heard me mention “The Dreaded Tablet Incident,” where between the release of Homunculus and Barque Hall of Heroes; I was unable to play Summoner’s War, due to my tablet deciding it was going to die on me. I’m still upset about that, but that’s not the focus of this article. Friend: Sara you okay there? Me: NAT5, [friend name]. NAT5. To this day Charlotte is my favorite monster, next to Eladriel. She’s my rep monster, my first six star monster, the first monster I transmogrified, and is also my Aiden Forest farmer. Some people say that Anavel’s the best Occult Girl, but if you were to examine my mind, you would hear, playing on loop in the background, next to “Beach boy pirate or riot!” is just me shouting “Charlotte best girl!” Now that I’ve tried to explain how much I love Charlotte, forgive me if this article turns out to be very biased. When you look at all the Occult Girls (with the exception of Nicki and Anavel, as their second skill is a healing skill), you’re going to see that they all have two AoE – Area of Effect – skills: Toy Knight and [Element] Guardian Angel. In Charlotte’s case, it’s Wind Guardian Angel. Toy Knight will have a 50% chance to stun enemies and decrease attack speed, and, based on the Occult Girl, their Guardian Angel will do different things. For example, Charlotte’s Guardian Angel will decrease the attack bar by 30% per hit, and has a chance to put Glancing Hit Increase on an enemy; Anavel’s Guardian Angel decreases defense for three turns, etc. When you see this, you’re going to think, “Wow! Charlotte has two skills that attack all enemies?” However, when trying to figure out which rune build to put on her, then the real dilemma occurs: Fatal or Despair? On one hand, having a Crowd Control monster on Despair would be really useful in places like Trial of Ascension, but on the other, Charlotte has the highest base attack of all the Occult Girls, which would call for Fatal! Don’t worry; I’ve tried both builds before, and I can say that I’m happier with having her on Despair. Sure, you get less attack stat damage, but you can also find some sweet ATK% substats on runes sometimes. I use Charlotte in pretty much everywhere but DB10 and NB10 (the latter I can’t even do yet,) and having a stunner is sincerely helpful. While, in the Cairos Dungeon, the bosses themselves can’t be stunned, it’s useful to have Charlotte stun a few of the trash waves so the team takes less damage. Of course, in Secret Dungeons, she’s probably the true MVP – stuns and sleeps and attack bar decreases, oh my! How Fast Should Your Cinnamon Roll Be? 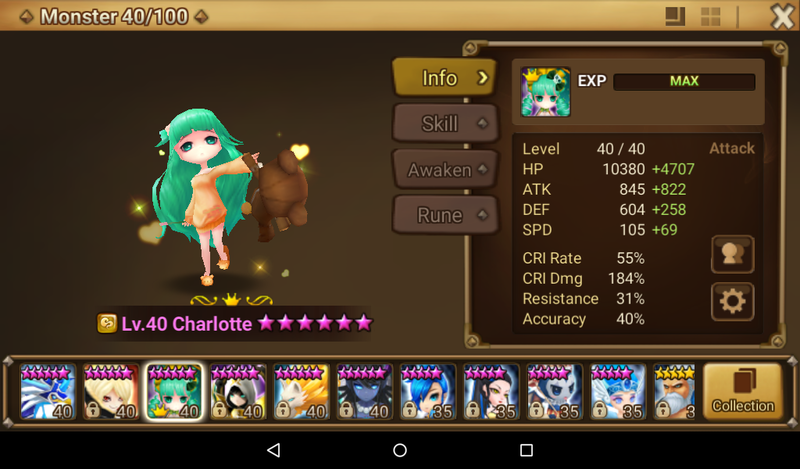 For a while, I didn’t have SPD on my Charlotte – her main stats were ATK%/HP%/ATK% because I didn’t know any better. As such, she only had, like, +16 speed. You can imagine she rarely got the first turn when it comes to Dimensional Rift farming and whatnot. They say that the main stats you should focus on when it comes to nukers is SPD/CRIT Damage%/ATK%, and maybe get a few HP% substats in there if your nuker is squishy, like Charlotte. This I can confirm is true. It’s obvious that you need your damage dealer to be fast, but how fast should she be? She needs well over +30 speed in order to at least get a turn or two before enemies attack, and even then you better have a good attack bar booster if you want her to move before her enemies attack. Luckily, though, her base speed is 105, so she’ll already be pretty fast. I think the optimal speed is 170 and above, and that’s not if you’re using her in PVP content. Charlotte is great, we’ve already established that, but where should you use her? I don’t know about late-game, so I’m not going to talk about that, but instead, we’ll be talking about early- and mid-game uses. Early-Game. Early-game is considered before you’ve gotten a GB10 team up and running and it’s fairly stable. By then, you should have a Faimon Hell farmer. (I didn’t, I just used friends’ reps.) If you’re like me, Charlotte can replace your Faimon Hell farmer – just don’t take her to Faimon! The best place to go would be Aiden Forest; it’s a water scenario, where Charlotte shines in, and water is weak against wind, so she’s kind of best gurl there. Currently, as my Faimon farmer, average times are around 1:00~, though I’m told this isn’t the best time. You can also use her in GB10. Because GB10 is a water dungeon (and as I’ve said, Charlotte is a wind monster,) she’s already at an elemental advantage. With her latest buff, Toy Knight can now slow down enemies, which is essential on the giant boss when you’re just starting out. On top of all that, she also has a major attack bar decrease, which would give the team an extra turn or two. The only downside is that Wind Guardian Angel hits thrice, and the giant counterattacks after the seventh hit on him. Its fastest time is 2:29, which I’d have to say is actually pretty nice for an utter trash like me. It’s not as stable as I’d like it to be (still get a few fails here and there) but it’s really nice, in my opinion. MID-Game. 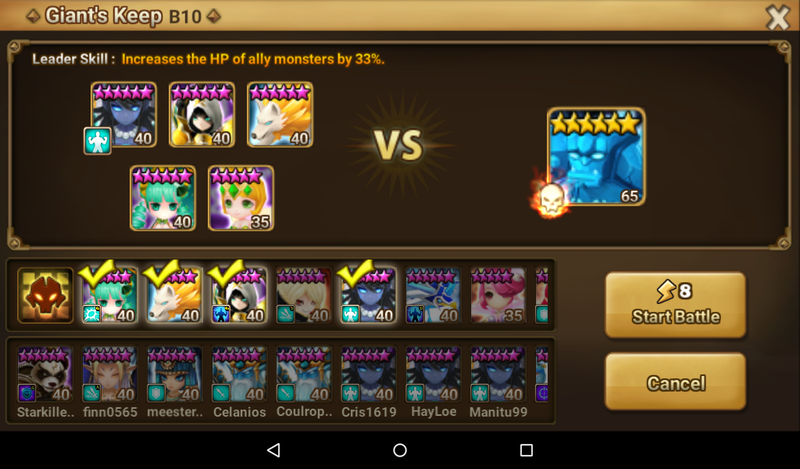 Around this point, you should have a stable GB10 team and a DB10 team, along with clearing Trial of Ascension regularly. I myself have just hit this part of the game, as I’ve just gotten a DB10 Tower Team with Sigmarus up and I cleared Trial of Ascension Normal for the first time a few days ago, on 8/30/17. If Baretta is the king of Trial of Ascension, then Charlotte is the true princess of Trial of Ascension. ToA is all about them stuns, continuous damage and attack bar pushbacks. Her third skill already does the last part, and, with Despair, every attack can be a chance to stun an enemy! I hope you guys enjoyed this article, as the next one is going to be Natalie; September’s Hall of Heroes! I’m actually pretty excited for an article about Natalie, because most people don’t think she’s good, but she actually looks pretty good to me! This is Sara Ann, and I’ll see you all in the next article!